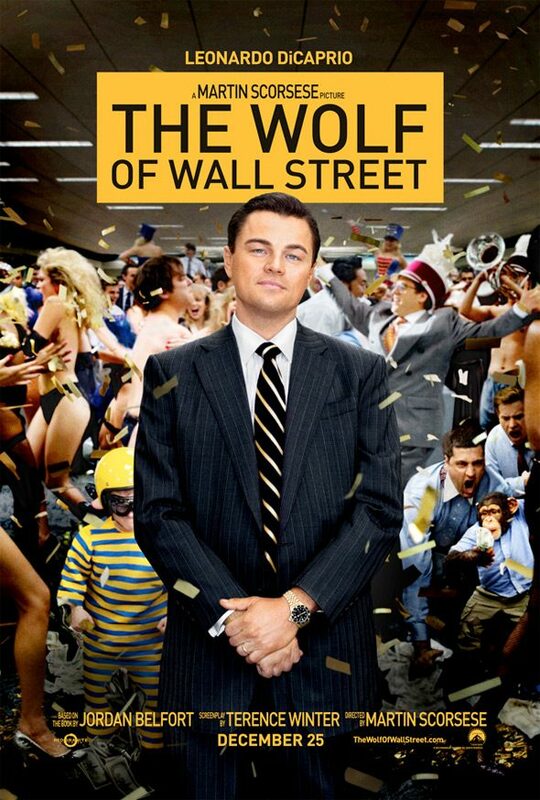 “The Wolf of Wall Street” is a beast of a three-hour movie from Director Martin Scorsese (“Hugo“). Based on the true story of Jordan Belfort, this movie makes Gatsby seem like a choirboy. From humble beginnings in the Bronx, Jordan Belfort (Leonardo DiCaprio from “The Great Gatsby”) just wanted to be rich and successful. He learned enough from one lunch with his boss (Matthew McConaughey from “Mud”) to do just that. He already had all the charm and smooth talking down, so eventually he starts his own firm with his new friend Donnie Azoff (Jonah Hill from “Money Ball”). Belfort is driven by booze, drugs, hookers and, most of all, greed. Money is the juice that gets him going in the morning, and his sole reason for living. That may be where the movie is lacking, but I don’t know. Belfort may be just as shallow as he is portrayed, and there is nothing else to him. His purpose in life seemed to be money and all it afforded him – which was every drug he could take so he could avoid life. This was a movie about a great salesman. Birth of a salesman if you will, and what happens when that is all he cares about. A salesman does not make anything or perform any service or create anything but money. The salesman’s job is simply to convince other people to give up their hard earned cash. The movie displays loads of debauchery, decadence and opulence, but I think this is like an average weekend for Leo. It is wrong to judge the man or his life when I am supposed to evaluate the movie. All they showed were the highlights – the cool, fun and crazy stuff – and Scorsese did a great job at showing that. When they tell my life story, I hope Leo plays me and Marty directs. I am afraid it will be an Adam Sandler movie, and not one of the good ones. This movie is more like a carnival ride than the epic it pretends to be. I know people say it’s not long, but it felt like an X-rated mini-series. This may be Scorsese’s opus to the glory days of Wall Street, but it is far from his best picture. I give this movie 3 ½ stars out of 5. I’m just not diving into a hot tub that shallow. While it did run-on for three-hours, I never found myself bored and that’s why it deserves to be seen. Good review Tom.